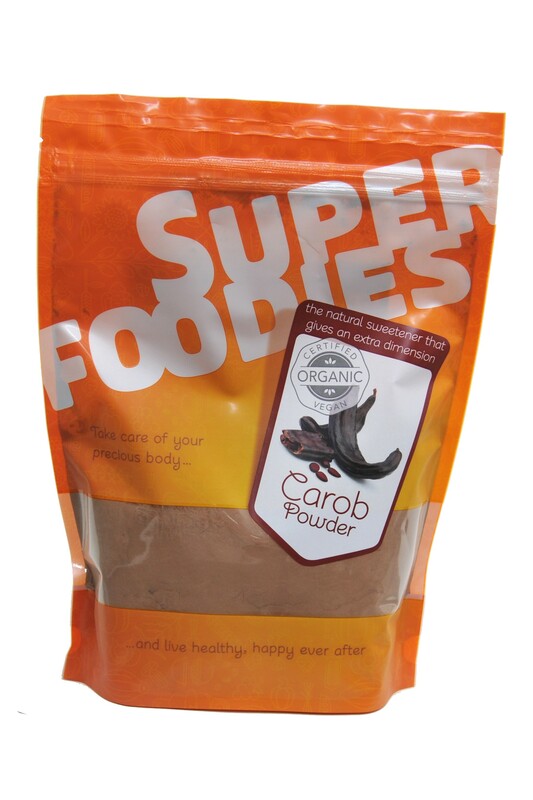 Carob powder is a delicious natural sweetener that boasts a mild, sweet, chocolate-like flavour. Carob powder is a delicious natural sweetener made ​​from the beans of the carob pod. Carob pods are also used to make locust bean gum and have been a important source of sugar before the cultivation of sugarcane or sugar beet. The carob pods grow on the the carob tree is a flowering evergreen shrub that’s native to warm, Mediterranean regions and a member of the humble pea family. 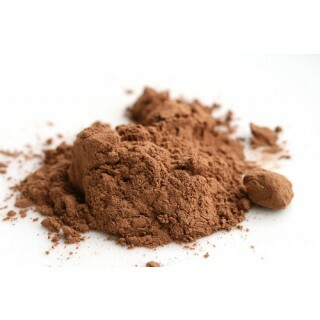 Organic carob powder is typically light brown in colour and boasts a surprisingly rich, chocolate-like flavour. It contains absolutely no caffeine and zero theobromine, making it particularly ideal for those who wish to avoid these stimulants. Carob powder is teeming with beneficial nutrients, such as B vitamins, the minerals calcium, magnesium, potassium, iron, manganese, chromium, copper and nickel, as well as plenty of protein and fibre. Carob is often regarded as nutritious, with as much vitamin B1 as asparagus or strawberries; as much niacin as lima beans, lentils, or peas; and more vitamin A than aubergine, asparagus, and beetroots. Carob powder is a delicious natural sweetener that can be used to enhance both sweet and savoury dishes. Carob contains approximately 8% protein and is a good source of fibre. Compared to chocolate, carob is three times richer in calcium, has one third less calories and seventeen times less fat. Carob powder contains B vitamins. Carob powder contains the minerals, calcium, magnesium, potassium, iron, manganese, chromium, copper and nickel. 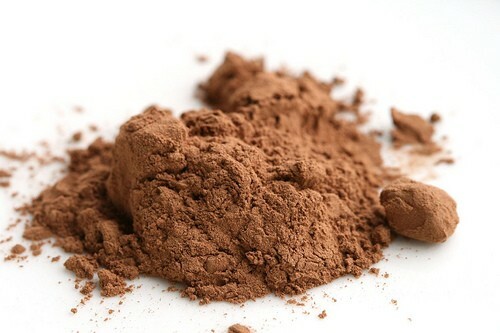 Carob powder also contains protein and fibre. Our carob powder has been certified organic by "Organic Farmers & Growers". Carob powder boasts a mild, sweet, chocolate-like flavour. Try adding it to your favourite smoothies, shakes and protein drinks, as well as desserts and other sweet treats for perfect results every time. A delicious chocolate milkshake flavoured using caffeine-free carob powder instead of cacao, making it perfectly suitable for any time of day. Ideal for children, as well as all those with a particularly sweet tooth! This rich and creamy carob shake is an absolute doddle to prepare – simply pop all of the ingredients into your blender and blitz until nice and smooth. Pour into a long, tall glass and dust with carob powder or a light sprinkling of desiccated coconut. Yum! 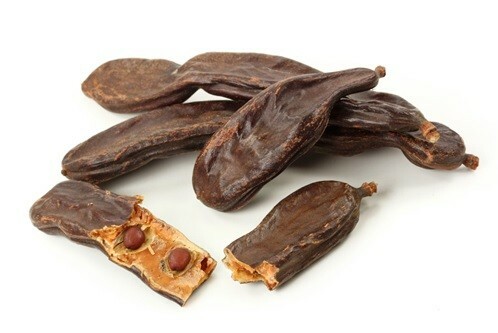 Carob has been enjoyed by a variety of cultures for centuries, including the ancient Egyptians. The word carob comes from the French word ‘carobe’, which originated from the Akkadian word ‘kharubu’. Carob powder is made ​​from the beans of the Ceratonia siliqua – a flowering evergreen shrub that thrives in Mediterranean regions and the south of the United States. 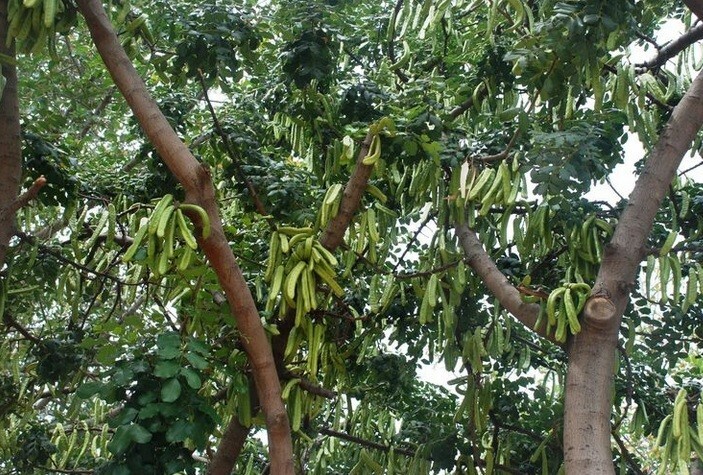 The tree bears fruit (carob pods) after six to eight years of growth, and can easily bear 100 pounds of pods per year by its twelfth year, increasing to an average of 200 to 250 pounds annually as the tree grows older. It can continue to bear fruit for 100 years. Carob shrubs are incredibly hardy and can go on producing carob pods for up to 100 years. It's a crystal-like powder that freshens up and cools all recipes and gives extra depth to chocolate recipes in particular. The pods are reddish-brown and can be up to a foot long. Carob has been used for food for over 5000 years. It is also called "honey locust" or St. John's Bread as this was consumed by John the Baptist while he was in the wilderness (Matt. 3:4). The husks that were eaten by the Prodigal Son in Jesus' parable (Luke 15:16) were discarded carob pods. The word carat, which is still used today to measure gold and diamonds, comes from the Arabic name for the carob seeds because of their uniformity in weight. Do not buy carob powder if you have an allergy to carob. Always read the product information on the packaging before deciding to eat carob powder. Packaged in an area where nuts are processed. Use carob powder in smoothies, shakes, nut milks, raw chocolate, desserts and other sweet treats. Women who are pregnant or breastfeeding are advised not to exceed the recommended daily intake of carob powder. Tastes as good as it looks and of such high quality.